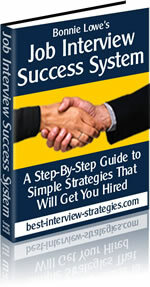 Job Interview secrets help you prepare for that important one-on-one meeting with a prospective employer. This is your opportunity to showcase your qualifications to an employer, so it pays to be well prepared. Ok, so maybe these aren't job interview secrets; they are more like job interview expectations (of you). Be ready to answer broad questions, such as "Why should I hire you?" Also expect those specific questions, like "Tell me your greatest weakness." Be well groomed (hair, nails, makeup, jewelry). Learn the name of your interviewer and greet him by name. Extend your hand for a firm handshake. Use body language to show interest - smile and maintain eye contact. Send a short thank you note afterward. Hopefully, these job interview secrets have given you some ideas about what to do for your next interview - as well as what not to do. If there is any one thing that you should take with you from this article, it's that you must be prepared. Employers want to see that you're going to be like on the job - so impress them early and make them WANT to hire you.